On Monday night – er, Tuesday morning – I woke up in excruciating pain. It was Right Toe #4 again. For the past week, I have been waking up, feeling rather uncomfortable from the blackened dead toenail which has been taking its sweet time in falling out. With Boston less than a week away, I’ve been worried about it, and I decided late Monday afternoon to get to a walk-in clinic on Tuesday; at the very least, I knew I needed an antibiotic. At 1:30 in the morning, I wished that I hadn’t put off the visit to the next day; Right Toe #4 was demanding instant attention. So I gave in, booked a supply teacher for the day at work and headed to Emergency. I was amazed at how quiet the hospital was, especially with it being the end of a long weekend. Within an hour, I was talking to the doctor. “That would be great!” Suddenly, I was bright-eyed and bushy-tailed as I knew that this would set me up for a more comfortable marathon. After freezing the toe, Doc pulled the nail out piece by piece. It didn’t hurt (the freezing took care of that). 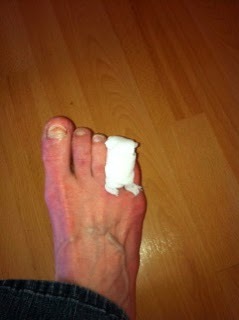 It felt like he was pulling on an elastic band; the occasional snap was a piece of toenail coming off. Once finished, Doc told me that the nail was essentially in-grown; the depth below the cuticle is what had made it so uncomfortable. I was home by 4:00 a.m., logged onto the computer again and unbooked my supply teacher. “I can get by on 3 hours sleep,” I told myself. I really did not want to take a day off work. When I crawled out of bed a few hours later, though, I cringed. “Awk! The freezing has worn off!” So I delicately walked across the floor, headed to the shower and got ready for work. I redressed my toe in gauze so that it was practically the same size as my big toe. By 11:00 a.m., I was taking the prescribed Tylenol 3 (which, by the way, has the pleasant side effect of teaching 29 twelve year olds in an echo-y computer lab headache-free). A lot of friends have commented on the lousy timing of this. Really, though, the timing was perfect. My foot has time to heal and I’m not sure that waiting one more day would have given it enough time. And, it is quite possible that the next doctor on call wouldn’t have done anything – and that would likely have become a bigger problem in a few days. Last night, I cycled for an hour; today, I ran for 75 minutes. Tomorrow, I’ll post my Day 2 picture, without the gauze – gotta do something to keep you coming back for more. Yikes, that sounds painful. I'm glad it's providing you relief and hopefully it's all healed up by Monday (or at least not uncomfortable)! Next Next post: Toenails are Overrated.